Sitting in hospital waiting rooms is really quite boring; I wouldn't encourage anyone to try it any time soon. 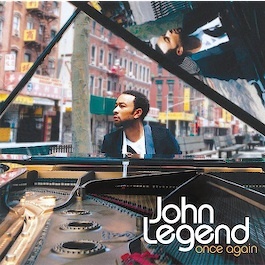 Anyway in light of this I've spend the last half hour or so chilling to John Legend's Once Again album on my iPod. I must say right up front before I get into the music itself, the quality of the music is excellent. 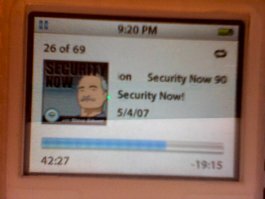 Even on my iPod with my fairly cheap Philips "Bass Boost" headphones ripped as a 192Kb/s AAC, his voice, the piano in the background and the backup vocals all sound amazing. Whichever recording studio he went to, he got his money's worth; the whole thing just sounds great. "Great" of course being the technical audiophile term. One of the reasons why I really love Michael Franks' music and John Legend's is that they're both capable of recording songs that really contrast each other (look at me trying to be all professional). What I mean is, it's much harder to classify their music under a single genre or style; for example John Legend has a few jazzy tunes, some R&B and even a slightly electronic track all on one album. To me it also feels as though the order of the songs is deliberate rather than just a last minute slap dash composition job. It's one of those CDs you would want to listen to in sequence, the mood and tempo of each track seems to flow from one to the next. It's really difficult to pick just one track that I would call a favourite! His chart topping song of course was "P.D.A. / We Just Don't Care" which I admit I do like, but I would have to say the first track "Coming Home" and "Each Day Gets Better" would be my top two. Again though it's one of those CDs that have such a diverse mix of styles that sometimes you may prefer some of the songs depending on what mood your in or what time of the day it is. All around, a pleasure to listen to and a great distraction from these bleak hospital walls. 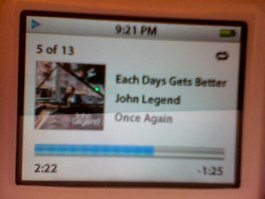 Not to say that I would only listen to John Legend in a hospital; you know what I mean. When my mixer board and mic arrive from those friggen removalist people's warehouse thing I'll review it in more detail.